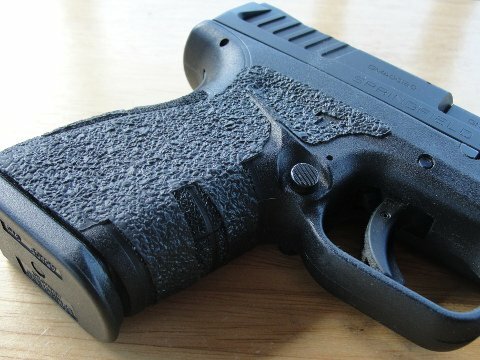 Springfield Armory’s XD Mod.2 is the latest version of the already well-designed, and supremely accurate, XD handgun that has been around for years. The Mod.2 lists several upgrades to make a near flawless handgun even better. This semi-auto, polymer framed pistol is striker fired and available 9mm, .40 S&W and .45 ACP. This subcompact pistol comes with either a 3, or a 3.3 inch barrel depending on the size of your chosen cartridge. The Mod.2 has a less blocky slide than the previous XD had. Although, after I compared it to an older XD, I didn’t really notice a difference. Also receiving a makeover, the slide serrations were cut deeper into the material with a more more pronounced look. This allows the operator a more favorable grip on the slide whenever a round is sent to the chamber, or the weapon needs to be cleared. This feature is especially good for first time shooters, or people with weaker hands. The sights on this subcompact have also been improved upon by adding a fiber optic front, coupled with a new lower profile rear sight. They are great for easier target acquisition during those instances when you need to get back onto target quickly. And, to sweeten the deal, the pistol delivers excellent accuracy out to the 10 yard mark. Of all the upgrades Springfield made to the XD, the best redesign on this weapon is the frame itself. 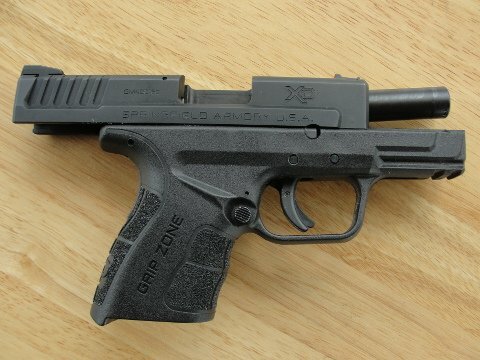 Even though the “Grip Zone” wording is, at best, a tacky addition to an otherwise awesome firearm, this subcompact pistol feels great in hand. And, if you dislike the wording that much, feel free to get a Talon Grip to cover it up. There is one issue that I had with the “Grip Zone” that went further than its aesthetics and wording. Namely, the fact that it feels like sandpaper on my torso when I walk or when I sit in the car. It really isn’t anything more than a nuisance, but after about a month, I didn’t want to deal with it anymore. There are a couple of ways to combat this. First, if you’re comfortable with a barrier between the pistol and your skin, like a t-shirt, you won’t notice the rubbing. This wasn’t an option for me, however, so I had to come up with something else. I got my hands on a set of the rubberized Talon Grips, which eliminated my issue. I’ve got about 500 rounds of ammunition through the the Springfield Armory XD Mod.2 and can say that, at the range, it is a good shooter. I’ve never experienced a single malfunction, and it seems to take pleasure chewing on the cheapest steel cased ammo I can throw at it. The pistol that Springfield sent to me was the .45 ACP with a 3.3 inch barrel. Out of the box, I thought that recoil would be on the snappy side, because, after all, it is a subcompact with a powerful cartridge. However, recoil wasn’t horrendous because they redesigned the weapon to allow the strong hand to sit higher on the frame and take each shot better. Springfield makes some of the safest pistols on the market today. Even though there is no manual safety to disengage, it is littered with safety features. For example, in order for it to fire, the grip and trigger safeties need to be fully pressed. And, visually, the striker status and loaded chamber indicators allow the operator to see if his/her weapon is loaded or cocked. There are a couple of things that I think Springfield can do better, and it isn’t anything that hasn’t been said before. First, the location of the mag release is hard to get to. I actually have to remove my hand from its good grip on the gun to release the magazine, which, as you can imagine, could be bad in the middle of a critical incident. Something else that would be great, would be a truly ambidextrous or stand alone lefty pistol. Even though the mag release isn’t comfortable to get to, you can reach it with both hands. The slide release, on the other hand, is only available to the right thumb. Finally, the Mod.2 comes loaded with the standard XD Gear. You get the speed-loader, holster, bore brush, cable lock, magazine holster, a nine round flush mounted magazine (.45 ACP), a 13 round extended magazine (.45 ACP), two extra fiber optic sights and the hard case. Personally, the only things I ever use besides the mags, are the speed loader and case. The MSRP on this handgun is plus or minus the $600 mark depending on whether or not you choose the stainless slide. And, I liked this subcompact carry pistol so much that I ended up buying one at the cheaper street price. The Springfield Armory XD Mod.2 is an accurate concealed carry pistol that is capable of firing any type of ammo available on the market. When the safety features and excellent quality are taken into consideration, you realize that this may be about as close as you can get to firearm perfection. Editor’s Note: Joshua Gillem is a guest contributor who currently serves as the editor for Gun Carrier.